One of my favorite meals to eat while traveling is breakfast. There’s something to be said for simple fare that’s popular among locals. Despite Hawaii being one of the 50 states, you can find our unique culture embedded even in your typical egg, toast and bacon breakfast. One option is to eat at Zippy’s – a longtime family restaurant specializing in local dishes like saimin, haupia desserts and somen salad. 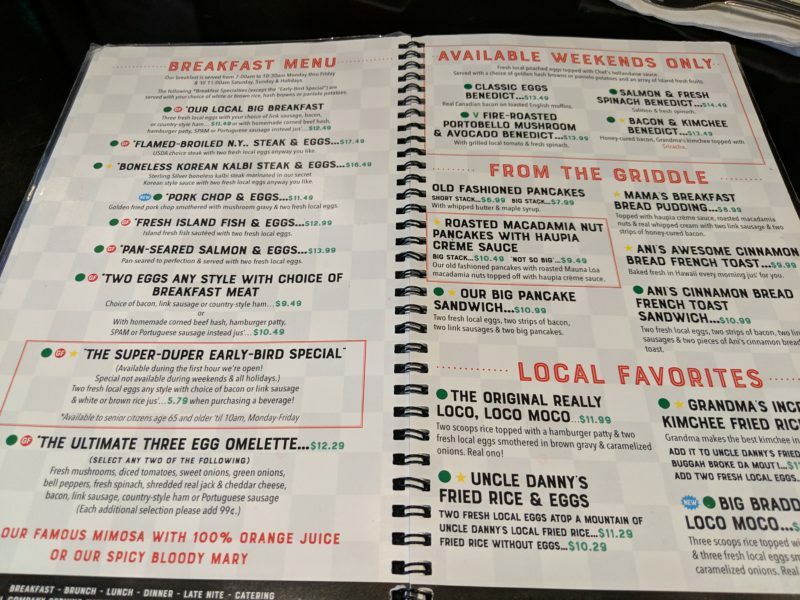 But another option is to visit Big City Diner like I did. You’ll find more traditional American meals here – breakfast, lunch and dinner, but with a more down-to-earth environment. With a mix of booths and tables, there’s always a local crowd here enjoying small talk, a late meal or catching a sports game on TV. Local Tip: Try their kimchee fried rice – it’s a popular choice! You know that early morning hour when most stores and restaurants haven’t opened yet? Big City Diner is great for those days. 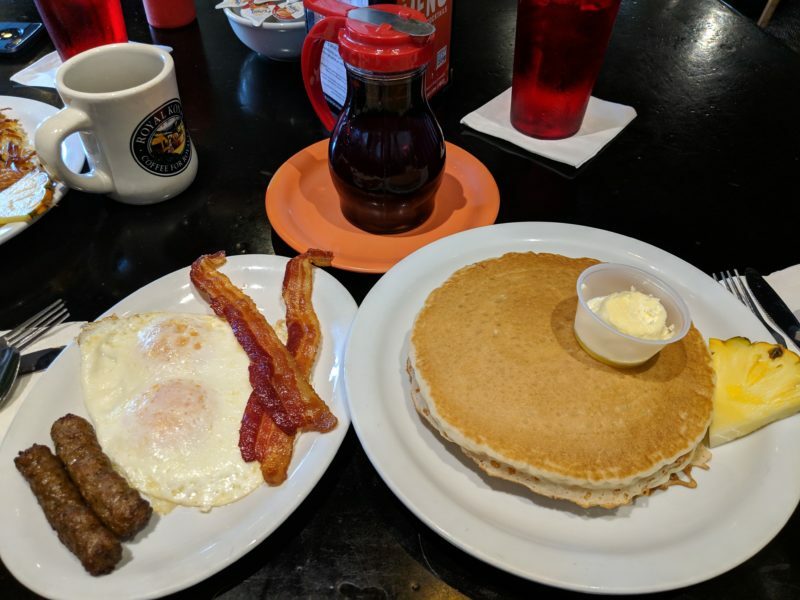 The local crowd flocks to Big City Diner for comfort food, sport games on the TV and servers that are quick to take your order and refill empty coffee cups. Each diner has got that Grease movie feel to it, which is kind of cool to find on the islands. There’s a wide variety on their breakfast, lunch and dinner menus and if you haven’t been to Hawaii yet, there are a few local choices that will catch your eye. A big local breakfast favorite are the macadamia nut pancakes with haupia (coconut) creme sauce – YUM. 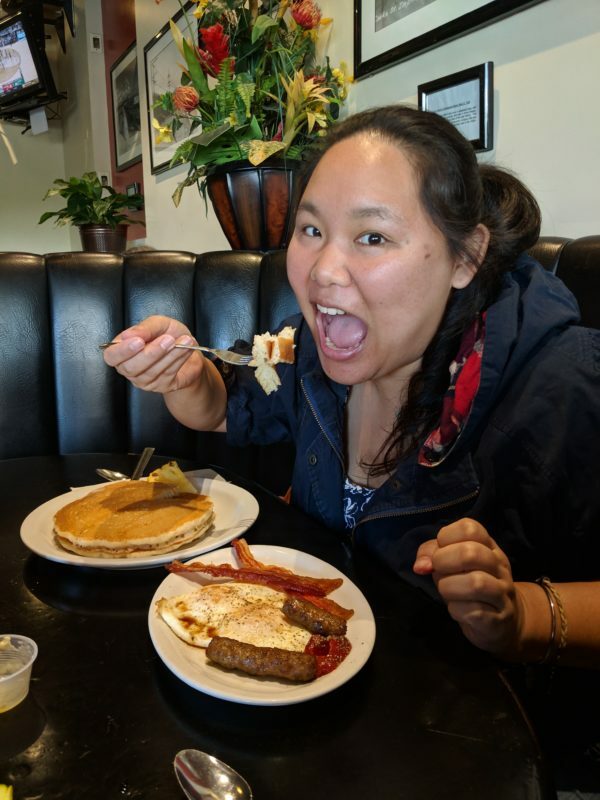 Local Tip: Other things I recommend trying are the loco moco with fried rice, korean kalbi, kimchee fried rice, Grandma’s incredible kimchee appetizer, kalua pork eggs benedict and the bread pudding. Everything was fast-paced. Conversations flowed and servers were constantly buzzing about. The 1st page in the menu book. 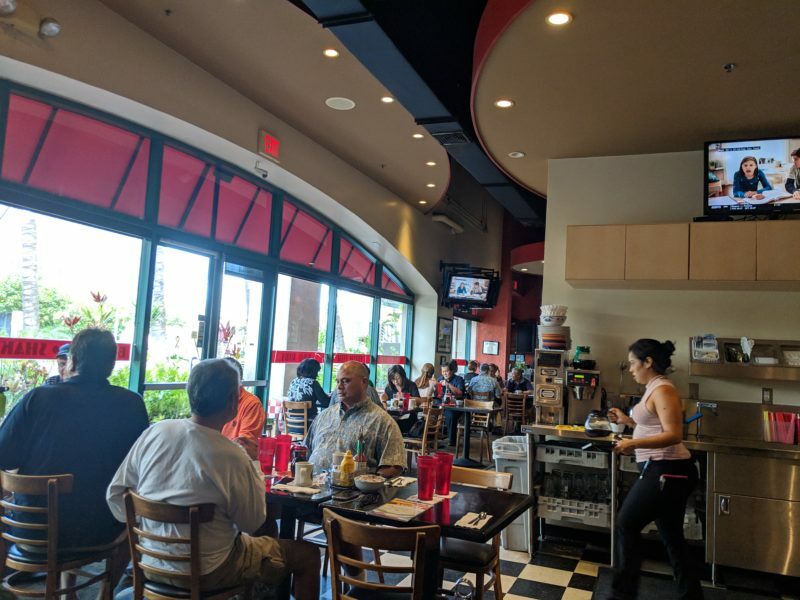 There are currently 6 Big City Diners on Oahu and all of them see pretty good traffic throughout the day. The photo below was taken on a Saturday around 8:15 AM (Ward location). There was already a crowd waiting outdoors, but for the 2 of us we had to wait only about 5 minutes before we were seated. 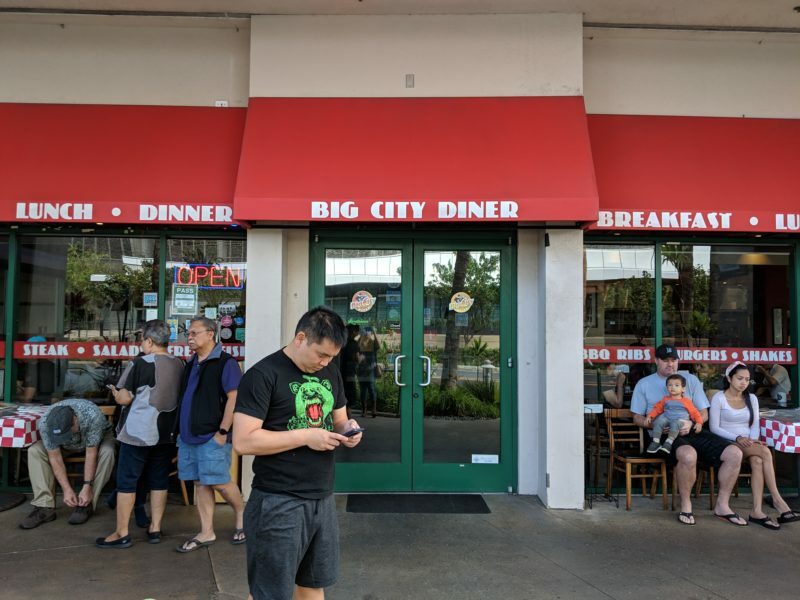 Local Tip: For those staying in the Waikiki area, you have a Big City Diner just a few minutes away, but most patrons will be tourists. The Ward location that I ate at had all locals, if you’re looking for that local atmosphere. It’s also easy to reach by bus. If you’re going by Uber, just tell your driver Ward Theatres and Big City Diner will be right next door. If you’re going by car, there’s parking in Ward Center and also at T.J.Maxx (about a 5 minute walk away). If you happen to be traveling around Oahu, other Big City Diners I’d recommend are the Waipio (5 minutes from my house! ), Kailua and Windward locations. My brother in his signature bear + melon shirt. 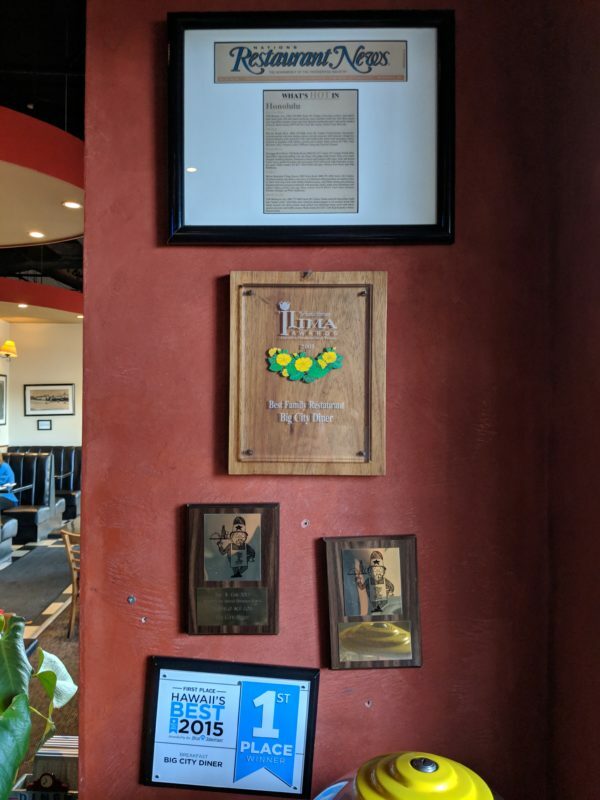 As soon as you step in, you'll see the numerous Big City Diner awards. After some internal debating, I decided to go for traditional fare: 2 regular pancakes with eggs, sausage and bacon. My brother opted for hashbrowns, eggs and Portugese sausage (huge favorite here in Hawaii). Condiments are provided, but try using the Aloha Shoyu (soy sauce) on your eggs. It adds that nice salty flavor to runny eggs and you’ll find plenty of locals using this on their meal, too. 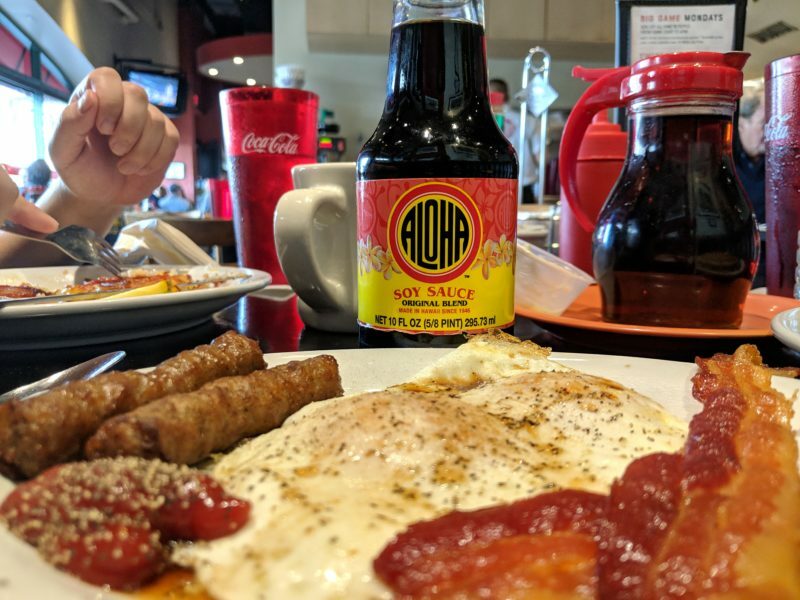 Aloha shoyu can be found at many local casual restaurants in Hawaii. The pancakes were filling and very fluffy - I definitely want to eat these again. So if you haven’t heard, I’m on the OMAD (one meal a day) “diet” and this particular day was my cheat day because I’d lost 20 Ibs (in 2 months)! My one meal is dinner and I’ve been eating unprocessed food, no carbs, no added sugars and it’s been going great. Long story short, I ate my first breakfast in 2 months and was hit by a wave of sleepiness so strong that my brother said I passed out in the car. Mouth open and everything. Ah, processed food. It's been a while! Big City Diner is very active on Twitter. You can follow them at @BigCityDiner and get updates on special deals (there’s always a deal going on). They’re also extremely involved with the local community so you can get updates on events with Big City Diner rewards. Tagging them in a tweet will also get their attention, too! Don’t worry if you’re not the adventurous eater. Big City Diner has loads of burgers, sandwiches, steaks, fries, etc. Open from 7 AM to 12 AM, it’s one of those places where you can feel comfortable eating during irregular meal hours. You can see their weekly promotions, menus and drool-worthy photos on their website. 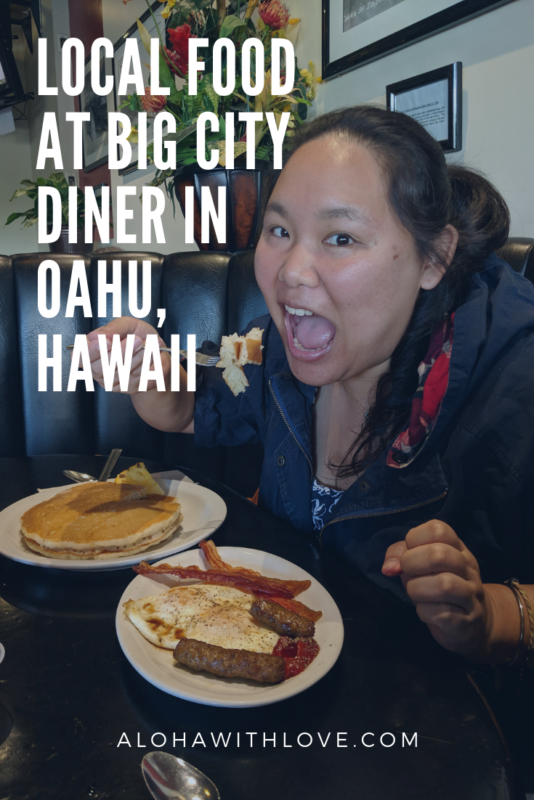 If you enjoyed this post about Big City Diner and plan to visit Hawaii someday, sign up below to get my local Hawaii tips. It’s free and I can’t wait to help you plan the perfect Hawaii vacation.